It’s National Donut Day. No matter how you spell it -- donuts or doughnuts -- these treats can be SUPER-HARD to resist. We're arming you with info so you can make the smartest splurge possible! Just like with mini candy bars, there's a good chance you'll consume more calories with these than if you treated yourself to a single donut, since it's so easy to keep going back for "just one more." Keep track, and chew wisely! Worth Ordering Online -- Fat-Slashed Donuts from Holey Donuts! Low-fat and reduced-fat donuts might sound as far-fetched as unicorns and leprechauns, but they really do exist! Holey Donuts! makes 'em. Each donut in the massive lineup (with the exception of the cinnamon bun options and the donut holes) has 145 - 230 calories and just 3 - 5g fat (PointsPlus® value 4 - 6*). NICE! And there are some CRAZY-DECADENT varieties: Chocolate Raspberry Cookie Crumb, Boston Cream Oreo Cookie, Pink Velvet, and SO many more. Check 'em out! P.S. Just like our beloved VitaTops, these are stored in the freezer, where they'll remain fresh tasting for a long time. Lucky you -- we've decided to release this book-exclusive recipe for our favorite jelly-filled treats in the world! It can also be found in the pages of Hungry Girl 200 Under 200. In a large bowl, combine cake mix with baking powder. Add applesauce and 1 cup water, and stir until blended. Evenly distribute cake mixture among the cups. 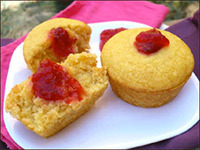 Bake until a toothpick inserted into the center of a cupcake comes out clean, 20 - 22 minutes. Spoon preserves into the bottom corner of a plastic bag. Snip off that corner with scissors. Use a knife to carefully poke a small hole in the middle of the top of each cupcake. Evenly pipe preserves through the hole in the bag into the holes in the cupcakes. Allow to cool completely, and enjoy! HG Tip! Feel free to experiment with your favorite flavors of sugar-free preserves, or even make these with a low-sugar variety! Chances are, you know a donut freak or two -- click "Send to a Friend" to pass 'em this info! 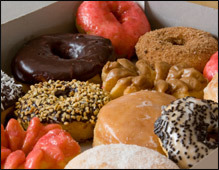 The first Friday in June -- that's today -- is National Donut Day. It's also the start of National Dairy Alternative Month, so wash down your donut (or donut swap) with a cup of coffee splashed with Unsweetened Vanilla Almond Breeze!